I always keep these products for my daughter Antara as she likes to use it as a make-up kit for her dolls. But we thought why can’t we use this lustrous , radiant shades to enhance paintings. Best thing is no need of brush, water, & pallets, you can use them directly . 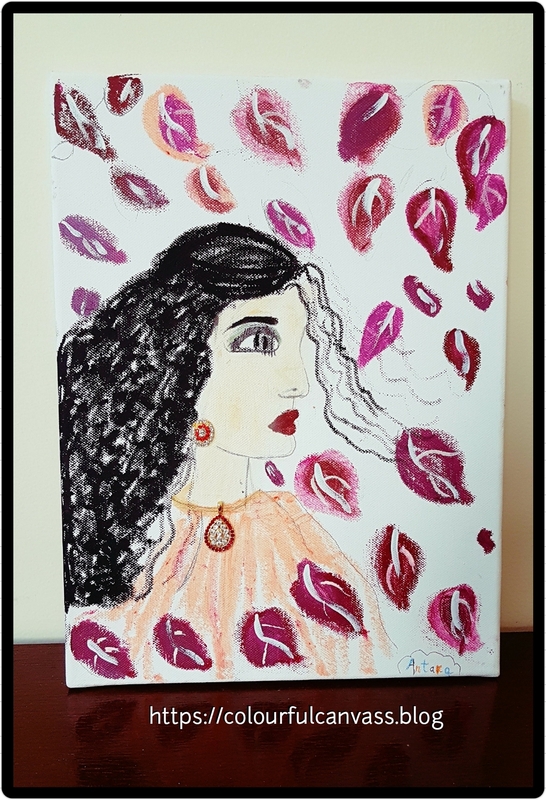 So we decided to give it try & with only expired make-up products, Antara made nice 3 canvas paintings . So sharing with you her little efforts. Use eyeliner last as its black particles fall on the canvas & very difficult to remove. You can try it on glass , papers & plastic plates. 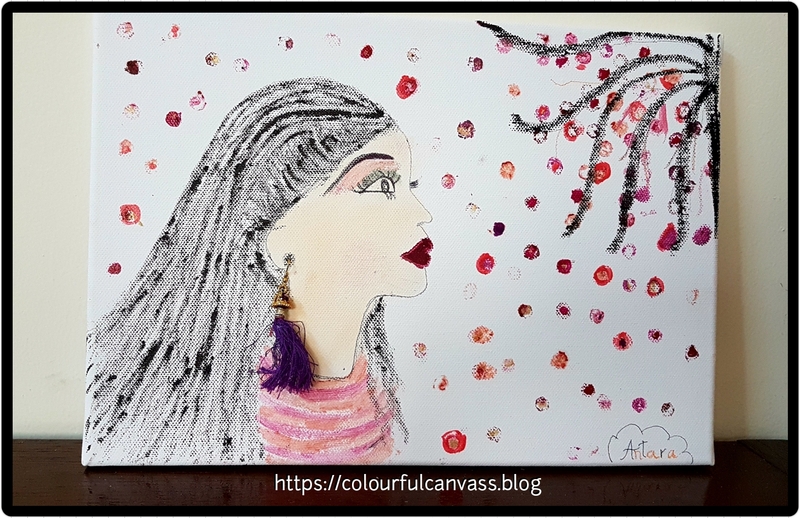 1st Painting – With shades of lipsticks, powder foundation, eyeliner & eye shadows. We stuck old jewellery to give more natural look. 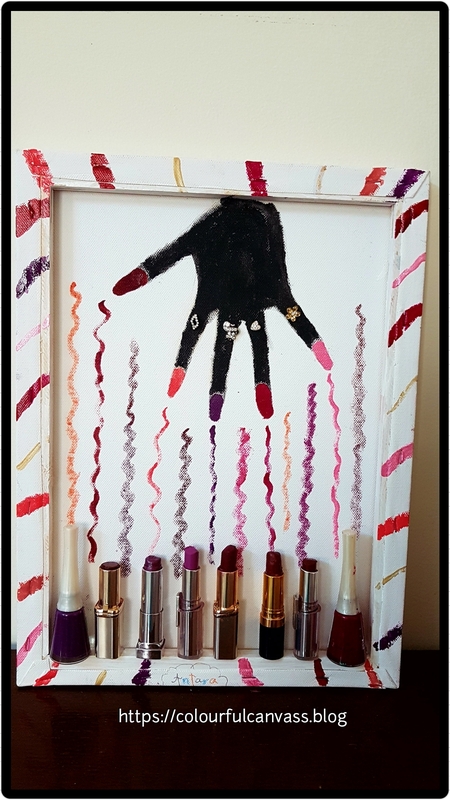 So girls don’t throw your cosmetics now reuse it in creative way. Thanks for visiting & stay tuned for more new ideas. Previous For your eyes only…. Wow! Your daughter is quite the little creative talent! These are beautiful!! Thanks Jessica. So glad you liked this & appreciation coming from you means a lot to us. That’s wonderful! now you can use them even after expiry date. Wow I am really really impressed! You and your daughter are a great team. It’s really sweet of you to say this Pragalbha. So delighted you liked this work. 😍😍Thanks Aparna . Have a great day! So creative! I love it.